Born into a musical family in New York City, music soon brought the family to Chicago where, at the age of 8, Aisha began singing with the world renowned Chicago Children’s Choir. She then studied bel canto singing with acclaimed voice teacher Lena McLin who ensured her students had a strong foundation while singing a variety of styles. Graduating from Columbia College Chicago where she was mentored by Sheldon Patinkin, Aisha’s professional career began with Little Shop Of Horrors at the Royal George Theater, Four Saints In Three Acts with Chicago Opera Theater and several productions at The Goodman Theater. She returned to New York in 1997 and in 1998 did her first Broadway show – Bring In Da Noise, Bring In Da Funk with Savion Glover, followed by RENT and Caroline, Or Change. Most recently, Aisha toured North America as Medda Larkin in the 1st National Tour of Disney’s Newsies and is featured in the “live-capture” movie to be released in 2017. Her work off-Broadway includes Nora Ephron’s Love, Loss And What I Wore and Stephen Sondheim’s Road Show. 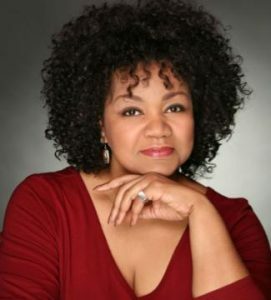 Her television appearances include Shades Of Blue, Blue Bloods, Law & Order, The Today Show and movie roles include Across The Universe, RENT , The Secret Lives Of Dentists and Marci X.
Aisha’s voice has been heard on commercial jingles for Chef Boyardee, McDonald’s, The Lottery and Cover Girl and several recordings including Dreamgirls In Concert, Caroline Or Change, Chicago (the Motion Picture), RoadShow and PopJazz. Aisha played “Bloody Mary” in a concert version of South Pacific with the Rochester Philharmonic Orchestra and she’s sung with Oleta Adams, Patti Austin, Smokey Robinson and Michael McDonald. Aisha’s own show, Jazzer at Heart, is a tribute to the music she grew up with. The music her parents loved and performed. The Great American Songbook. She’s performed at jazz clubs and festivals around the country.